Now fully launched in the U.K., with a U.K. based data center, Hostek continues to provide solutions for small to enterprise sized businesses. Although they do offer shared web hosting plans, Hostek is definitely more designed and focused on business web hosting. Data Centers: A choice of data centers across the globe, including: St. Louis, MO, Ashburn, VA and in the UK. A wide range of data centers is good; you can choose your server location based on the majority of where your traffic comes from. This will equate to a better user experience all round! IaaS: Infrastructure as a Service (IaaS) includes a private VLAN, VPN, load balancer, and dedicated server engineer team. These are all features which really take web hosting to the next level, ideal for business users. Hostek’s VPS hosting comes in several shapes and sizes. It covers pre-configured servers through to custom built servers. At first glance, you may think Hostek’s web hosting is a tad on the expensive side. What you need to remember is the power and performance hiding behind each plan. Did I mention the amount of features that are included in all of their plans for free? Avast Anti-Virus: Your server will be protected from viruses, trojans, and other malware. There’s no extra charge for this, and it’s included on all VPS plans. For those wanting a premium Anti-Virus option, ESET Anti-Virus is available. 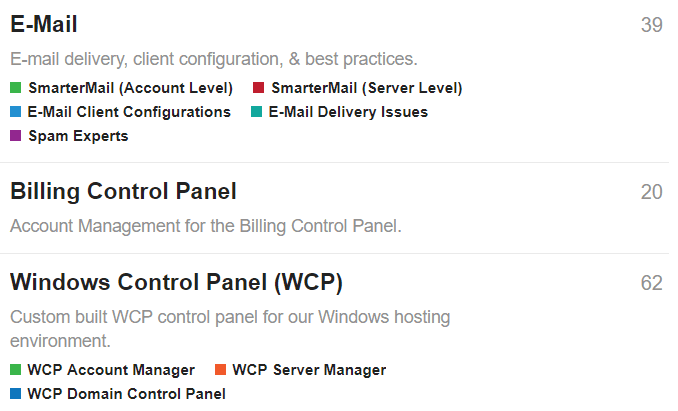 Hostek Control Panel: Hostek use their own control panel for their web hosting. You can trial their demo here. The control panel is easy to use, intuitive, and works just as well as the familiar cPanel. Free Migrations: If you’re migrating from another web host, you can do so to Hostek absolutely free. Hostek will assist in transferring your website, data, and files, with no hassle and no cost. 99.999% Uptime: An uptime guarantee is really quite essential when choosing a web host (to me anyway). Hostek’s uptime guarantee is very reassuring and displays just how professional this host is. Dedicated servers include managed servers and 24/7/365 support. This allows Hostek’s customers to focus on what really matters – their business and their website. You won’t need to worry about your web hosting, how it’s performing, issues, etc. because that will all be dealt with by Hostek’s professional team. Hostek’s web hosting doesn’t just stop at web hosting. They really do cater for their customers, providing an all round service so that you can put the management to the back of your mind. A load balancer essentially monitors the load on your web server and splits it across servers. This reduces the load on one server. Regardless of how much RAM or CPU your server has, it will always have a limitation, hence the need for a load balancer. You can contact Hostek for a personalised quote to discuss your requirements. This is another aspect I like about Hostek; they don’t apply a blanket price for their additional services. They understand that customers are going to have different needs and cater to this! A VPN is a great option if you want to manage your server from anywhere in the world, especially remotely. Small or large, all businesses can benefit from this feature. You’ll have the ability to connect to your server remotely and securely, including mobile access. If you’ve got multiple servers, a VLAN would be a more appropriate option. You can make a direct connection without having to pass through public connections, reducing the security risk to your server. You’ll be able to enjoy super fast connections, lower latency, and increased throughput. Hostek offers 24/7 support, so you can be reassured that you can contact them at any point during the day or night. They’ve got a wealth of FAQs, knowledge base, ticket system, telephone contact, and live chat. I love the fact that there’s a forum where you can discuss issues or raise questions with other members of the Hostek community. This is another example of being able to immediately access information should you require it. Hostek’s customer support was very helpful and friendly – you can tell that their team is extremely professional, and should you have a problem, they’ll be able to sort it out very quickly and efficiently. For me, Hostek’s dedication towards their customers shone throughout my experience with them. From the offset, I got the impression that they were a professional service who catered for small to enterprise sized businesses. They have a huge range of servers on offer, from VPS to dedicated servers. You’ll also have the choice as to whether you want your server managed or not. The features included with all of their servers are simply brilliant, protecting you from security attacks at no extra charge. If your business relies on a a stable and powerful web host, I’d highly recommend Hostek. I don’t think you’ll find better business web hosting elsewhere!